Where to Buy InVict Gold, InVict Gold Cockroach Gel Bait - 4 x 1.25 Oz - $25.95 for Sale with Fast Free Shipping! InVict Gold Cockroach Gel Bait - 4 x 1.25 Oz is formulated for extremely rapid control of roaches contains 11 food grade attractants. InVict AB Insect Paste Bait Insecticide - 5.. It is very different from other available roach baits, to combat bait aversion and maximize control. It works for German Cockroach only. 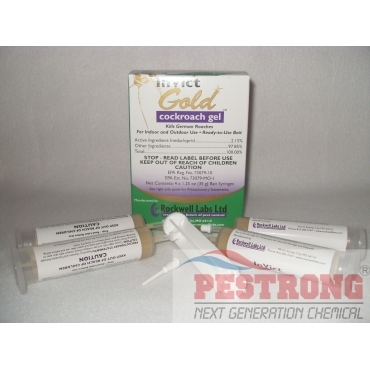 InVict Gold Cockroach Gel is formulated for extremely rapid control of roaches with imidacloprid. The bait matrix contains multiple food grade attractants, but none of the top 8 allergens. It is very different from other available roach baits, to combat bait aversion and maximize control. Bait rotation with different formulation types is important to combat bait aversion and poor control results. InVict™ Gold is extremely well accepted by both “normal” and “bait averse” roaches providing lightning fast results. Secondary kill has also been demonstrated, where roaches die when exposed only to other roaches who died from the bait and their feces, but not to the bait directly. The unparalleled palatability of Rockwell Labs’ bait formulations combined with the power of Imidacloprid is a winning combination. Sold one box of four(4) syringes containing 35 g (not 30 g) of bait and twist on tip & a plunger. Use Sites: In and around structures, including, but not limited to, residential, multifamily,commercial, industrial, municipal, institutional, research, recreational, health care, educational, daycare, hospitality and agricultural buildings and other man-made structures, garages, transport vehicles, sewers, animal rearing and handling establishments and food handling and food processing establishments. range from 10 to 20 spots per 100 square feet. Use the higher number of spots when infestations are heavy and/or when roaches are living primarily in wall voids or other inaccessible areas. Smaller, more frequent spots are better than occasional large spots. is in operation, only apply bait in cracks, crevices, and other inaccessible areas, or in tamper-resistant bait stations. Follow above directions for crack and crevice placement. Avoid contamination of food and feedstuffs.Never apply bait directly to a surface where food is stored, prepared or served. Any bait that is left visible after treatment must be washed up. Apply bait on the outside surfaces of buildings and other structures, as well as in crawlspaces, attics and other voids. Porches, garages, sheds, AC units and other outbuildings, fences or walls may also need treatment. Pay particular attention to cracks where roaches may enter buildings and treat those areas. These areas include but aren’t limited to cracks around windows, doors, eaves and soffits, expansion joints, and areas where lines or pipes enter buildings. Under siding and molding are also attractive areas for insects to hide. Apply bait in spots or lines as indicated for indoor baiting. I tried different gel baits for the roach at my house, and this works the best for me, it really is "gold"
Finally a product that works in my apartments. Being landlord always having issues with roaches. This product really works. Very pleased with their website and all the helpful info on it, good selection of products and reasonable prices and shipping. The product was well packaged and arrived in perfect condition.